The much-awaited update of Ford’s hatchback gets a number of changes inside out and also gets a new set of petrol engines. The car you see here is the top-of-the-line Titanium Blu variant, which gets a sportier-looking, all-black grille in what Ford calls a ‘cellular’ design and C-shaped fog lamp housings with blue accents. The black roof and black 15-inch alloy wheels are a nice contrast to the body colour and make it stand out in the crowd. There are very few changes to the rear; the Ford Figo facelift gets a redesigned bumper, and there’s no escaping the fact that the Titanium Blu variant looks much like the previous Figo’s Sports Edition, which was launched in 2017. However, the small details to the design do well to differentiate it from the previous car. It’s also worth noting that the lesser Titanium trim doesn’t get the contrast roof, sticks with 14-inch alloys and all those black and blue accents are chrome instead, just like on the Aspire sedan. The equipment list has also been updated, with the biggest addition being a 7.0-inch touchscreen. Test drive for Ford Figo . The side profile is identical to the pre-facelift model except for the blue and black decals and Aspire’s multi-spoke alloy wheels finished in gloss black. The roof as well as the outside rearview mirrors feature a gloss black paint job to jazz up things in the sportier Blu variant. Apart from the Oxford White that you see in the pictures, the Titanium Blu variant is also available in Moondust Silver and Smoke Grey. Speaking of the regular model, the flashy orange shade offered before has now been replaced by the White Gold which debuted with the Aspire. The cabin of the Titanium Blue variant is all-black — the dashboard, the headliner, everything is jet black! There are blue accents on the doors to complement the exterior theme and the dark upholstery features contrasting blue stitching. The darker theme lends the cabin a sporty feel, but some could find it a bit claustrophobic. Personally, I love the black headliner on this variant. However, this all-black treatment is limited to the top-spec Titanium Blu variant as the lower Titanium features a lighter headliner. Ford has not tinkered the suspension setup with this facelift. So, the Titanium Blu or the other variants don’t get the stiffer setup offered before with the S to aid handling. It is, for now, a successor to the previous S variant, but aesthetically. The suspension setup on the Figo is well tuned for Indian conditions and it offers a mature ride. It feels a bit bumpy sometimes at the back, and this is something we’ve experienced with the Freestyle and Aspire as well. These aren’t deal breakers though, but some might experience these things. The steering on both cars is quite sharp and precise. Turn-ins are precise and you have a decent feel from the tyres as well. Thanks to around 30kg lesser kerb weight, the petrol feels slightly lighter to driver and chuck into corners compared to the diesel. Overall, the driving dynamics of the Figo remain engaging and praise worthy, and have only bettered compared to the pre-facelift car. The updated Figo is available with dual front airbags, ABS with EBD, front seatbelts reminder and rear parking sensors as standard across the variant lineup. The top-spec Titanium Blue variant adds side and curtain airbags, which are exclusive to the Figo in the segment. The petrol automatic variant exclusively comes with ESP (electronic stability program), TCS (traction control system) and HLA (hill launch assist) — these are also segment–firsts. Ford Figo On-Road Price in Bangalore ranges from 5,70,568 to 9,32,849 for variants Figo 1.2P Base MT and Figo 1.5P Titanium AT respectively. Ford Figo is available in 13 variants and 7 colours. 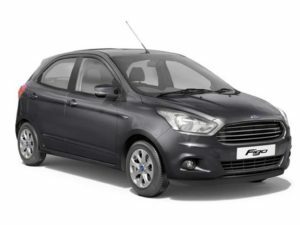 Below are details of Ford Figo variants price in Bangalore. Check for Figo price in Bangalore at Cazrprice.